Payments of Interest Income. 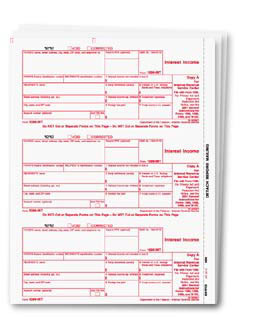 This 4-part laser set includes preprinted Copy A (federal, red scannable), and blank 3-up laser sheets for copies B (recipient), C (payer and state). All 8 ½” x 11” sheets are constructed of 20# laser paper 3-up with a ½” side perforation and do not include recipient instructions on Back. Order the quantity equal to the number of employees for which you need to file, you’ll get all of the necessary forms. Mail payer copies in a batch to the IRS. Mail recipient copies in envelope #99DWENV05 or #99SWENV05. Size: 3 7/8" x 8 1/4"